The Naval Postgraduate School's Operations Research Department offers M.S. and Ph.D. degrees. It is without peer in terms of the extent to which graduate education is integrated with a commitment to solving real military problems. As the senior member of the Energy Academic Group and a faculty member in both the Operations Research Department and the Business School at Naval Postgraduate School (NPS), Dan Nussbaum provides several critical functions. 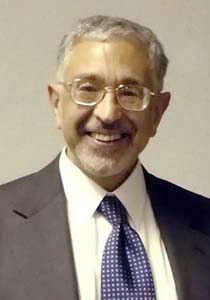 He teaches courses in Cost Estimating and Analysis, mentors students throughout their graduate coursework, including their master's theses, provides Cost Estimating and Business Case Analyses for DoD organizations such as Department of Navy, Department of Air Force, Department of Army, and the Office of Secretary of Defense. He designs, develops and delivers distance learning courses in Cost Estimating and Analysis, especially the world's only all-distance learning Masters in Cost Estimating and Analysis. He chairs the NPS Energy Academic Group, and provides leadership to SECNAV Executive Energy Education program. Professor Daniel Nussbaum testifies before the House Armed Services Committee on how to improve the acquisition and cost estimating processes in the Department of Defense. Watch the Video (at 23:15) or download the PDF transcript.